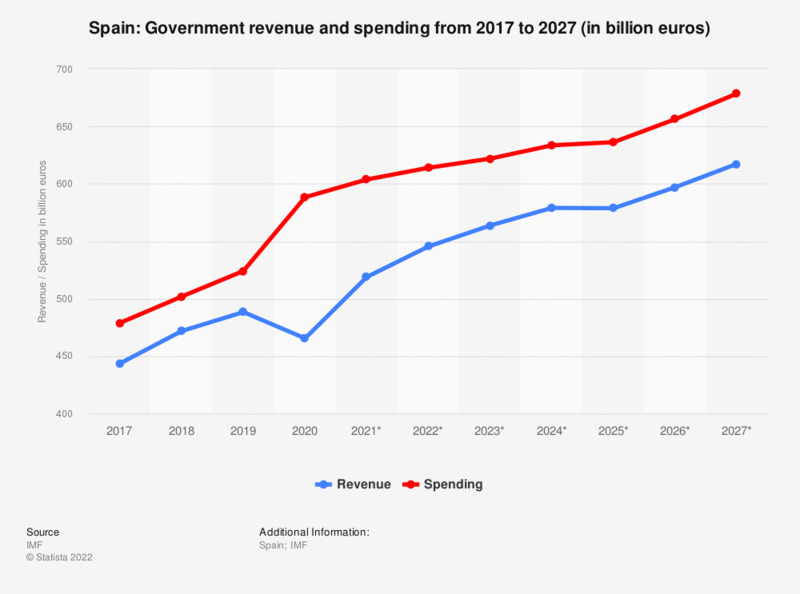 This statistic shows the government revenue and spending in Spain from 2012 to 2017, with projections up until 2020. In 2017, government revenue in Spain amounted to around 441.1 billion euros, while government spending came to around 477.33 billion euros. The Spanish economy not only ranked as one of the largest economies in Europe, but also in the world. Due to foreign investments in Latin America, high-caliber infrastructure and an increasing volume of exports, Spain’s economy remained at a relatively high standard up to present day. However, the Spanish economy has also experienced its ups and downs, particularly during the late 2000s and early 2010s. The global financial crisis of 2008 was the first step towards the slow collapse of the Spanish economy, which was then followed by the Eurozone crisis, which initially began in 2009. During these years, government spending dramatically exceeded government revenues and as a result, Spain was forced to absorb regularly increasing debt in order to sustain and preserve the state of the government. Unemployment was always a weakness within the Spanish economy, having never really reached economically appropriate standards for a country of its stature. Prior to the economic crisis, Spain’s unemployment rate remained relatively stable, however saw a sudden but dramatic rise during the following years and currently has the highest unemployment rate in the European Union, only surpassed by Greece, whose economy is arguably in the worst condition in all of Europe.